Gardeners love hardy plants and they also like those with great flowers, Campanula generally fit the bill in both cases. They are perennial plants and range from low growing ground cover types to tall stately varieties. With nearly 300 species, Campanula are a versatile perennial flowering plant that can make a good ground cover, be used in hanging baskets or be used as a feature in the cottage garden, forming a clump. Some varieties make excellent ground cover plants with dense basal foliage. Some are widely used in the garden, others are rare such as Campanula sarmatica pictured right. However the world of campanulas does have a lot to offer. Bell shaped flowers on some species purple to white above heart shaped leaves, most are with upright flower spikes depending on type. Campanula generally require a sunny position and a fertile soil, they can be cut back after flowering to promote a second flush of flowers and generally are dormant in the winter. Propagation is from division or from seed, and once established they are really an easy care plant. Position – most varieties prefer full sun to a little afternoon shade. Soil – Humus rich, well drained and a neutral soil ph. Flower Colours – From white through to pink, mauve and blue. Flowering time – Spring to summer. Fertiliser – Top dress with some compost and aged cow manure in late winter. Propagation – easy by division of established clumps, also possible from seed. Pruning – Prune back toe ground as the foliage does back. C. medium, the popular Canterbury Bells. Ground Covering species such as C. punctata ‘Pantaloons’ and C. poscharskyana, C. calycanthema as well as C. persicifolia cultivars such as ‘Blue Bloomers’ which are a taller growing species with star shaped flowers. 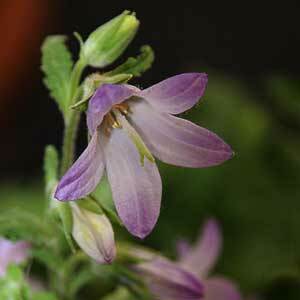 C. portenschlagiana and Campanula longistyla are other species worth considering. C. takesimana is the Korean Bellflower. C. grossekii with its violet blue starry bell shaped flowers is long flowering, will reach nearly 1m in height and it spreads slowly.